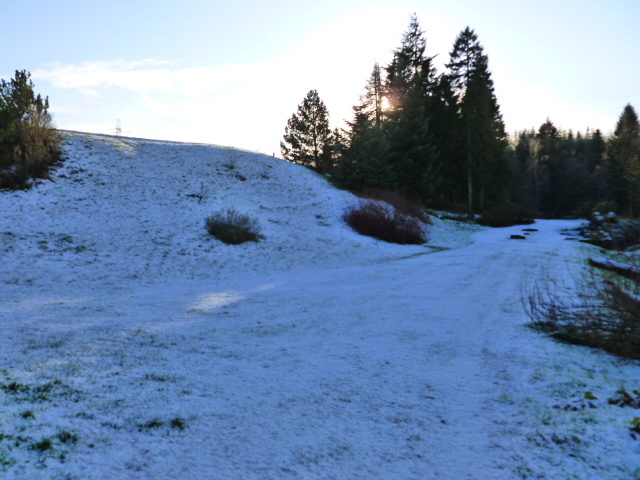 The first snow arrived today. Not much, but enough to coat the garden. Traffic at the bird table has increased, and the morning feed was gone by noon. There’s likely a message in that, and it’s time to get in the day’s supply of wood while the sun is still out. The work with the saw back in September is now paying off. One barrowload is roughly one day’s supply. Will there be enough? I become increasingly obsessional, because I know that once there is significant snow or ice, the fuel tankers take one look at the hill outside on the house, and turn tail for home. 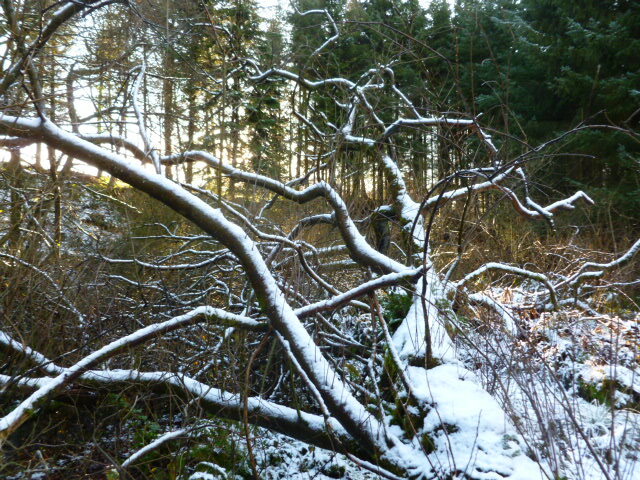 This entry was posted in Gardening in Scotland and tagged snow scene, winter garden by kininvie. Bookmark the permalink. The sna’s here too. Again not too much yet – but enough to make us think hard about fuel etc. That silly primula didn’t listen to your wisdom did it? Daft plant. 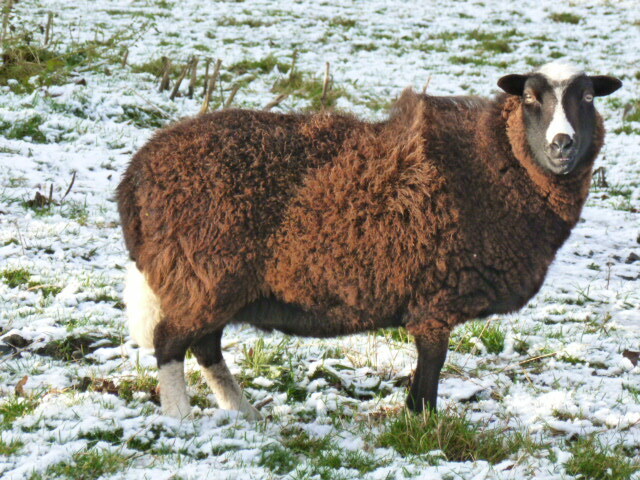 And, an ungrateful sheep which mocks wellies shouldn’t really call itself a sheep. Without wellies how will it get its neeps over the winter??? I have log envy, what a supply I get excited by a wood pile, I really do! Unfortunately no open fire here – our landlord bless his dear heart, in his wisdom blocked up all the chimneys of the homestead and put in storage heaters (which means I get the heat I need today, tomorrow – what an utterly fabulously stupendously daft invention they are both silly landlords and storage heaters). I lived in the inner herbrides for years, I ken gan tae the peats richt enough. It’s not a skill. Brag about. Did however help (meagrely) with highland park with a project to ensure their peat extraction was as Eco-friendly as possible. Much better for it used in a decent malt than on my fire -job well done. Ah, malt whisky – a whole other passion…….. Sadly the wise man I rent from put a fixed cooker and kitchen cupboard in front of one lum and blocked a wall over the other. perhaps he hates fireplaces? I’m sure that’s true, I’ve never tried. 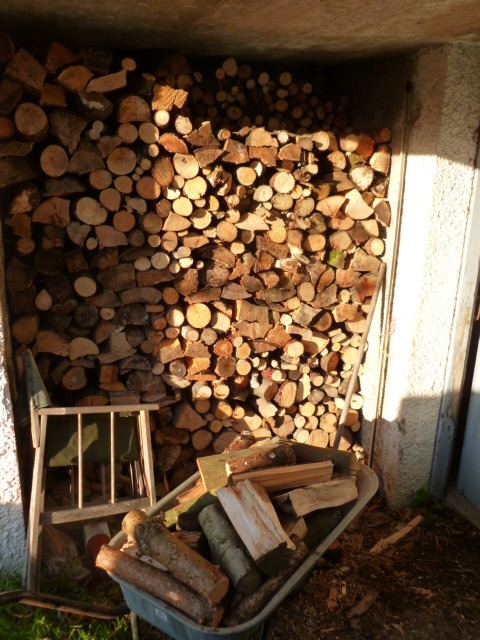 I was just wondering that it might be difficult to have a wood pile in Orkney – even if you had a fire? Glad you landed safely. There’s to be an Orkney-style gale in central belt apparently. Maybe the wind is following you? Wow. I’ve just realized I have very similar feelings about cats, dahlias and snow: all very nice, in others’ gardens. That blue primula with some cold hat is beautiful BTW, the goat’s scary instead. Your first light snow is about what we get all winter here. I prefer the unusual year when I can’t get out the drive for a week.– Looking forward to your coming photos of deep snow, which it seems Scotland can count on every winter. This was a lovely post. 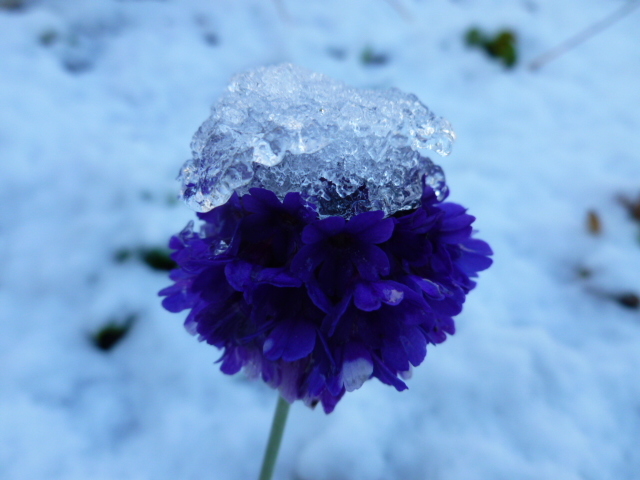 The ice on the bloom is adorable. A note to Alberto: Why are you at work when Mina is in labor!? Go home! 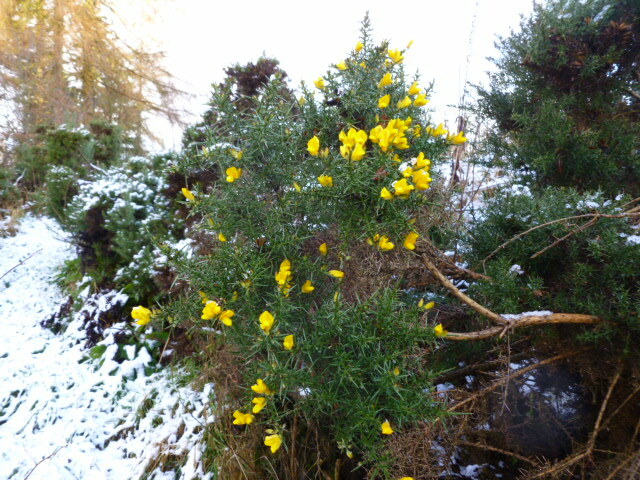 We too had our first snow in Arigna today. Just a scatter but more promised. I’m not very keen on snow so don’t waste time wishing for it but it does mean you can take lovely wintry pictures like yours. Our log pile is going down quickly, there always seems loads at the beginning of the ‘fire’ season, then suddenly the pile has gone right down and panic sets in. I so recognise that feeling of panic. If I burn all this now…what will happen in February? Snow, what snow? I can see a dusting on yonder hills but Cairn ‘O Mount is still open so it can’t be that bad. Do you remember this time last year? Even Montrose was knee deep…. Yes, I remember it all too well. 50cms on 30th November. Edinburgh airport shut for 36hrs, pantomine cancelled. 2 1/2 mile trudge to the shops to stock up on booze….. Which is why I am warily looking out of the window… But of course, this year we will scarcely have a frost! Great snowy pictures. I was stood by my log store yesterday wondering whether we’ll have enough to see us through. Think we’ll have enough until February but will need another delivery. It has been pretty mild here in Wales but when the nights are so long and dark I like the light from the fire so I’ve lit it anyway. Really reminds me of being in Scotland. Stunning half light and neatly stacked wood makes me want your weather to get here.